So nice to meet you Fifi Flowers readers. I am honored to be guest blogging today for Fifi. This seems like a match made in heaven, since Fifi Flowers is devoted completely to Paris for the month of April and I loved being in Paris. I felt like Paris was home to me. We visited the amazing city of grand ‘Paris’ (French pronunciation) as a Southern California family transplanted from Toronto, Ontario. We were use to speaking Canadian French in Montreal, but had no idea what was in store for us in Paris. Paris is a magical city that seems to call to you even after you’ve left and traveled home. I am still drawn to the Parisian movies and music, but the food and smells are difficult to replace. If asked I would go back to France at anytime and stay for any length of time. Just name the time and the place and I will go and pack. OK forget the packing I will buy everything there. Some of my fondest memories of Paris are of the sidewalk cafes, art shops, boutiques and chocolates. What a wonderful way to live! It felt almost as if the Parisians knew a secret to living that the rest of the world didn’t yet know. I felt transformed and wanted to dress, talk, eat and gesture like the women. Well at least I knew how to ride a bike. Now all I needed was a basket in the front with fresh cut flowers from the open markets. After two weeks in Paris, I started waking up every morning in search of the cities best baguettes and Brie cheese to bring back to the hotel. But then Paris adds a perfect cup of coffee or an amazing glass of wine to their baguette. In most of the bakery’s people were allowed to smoke just outside so I would have to protect my warm prize from the smoke. This changed how I would forever see my breakfast. Eating some cereal with some toast still just doesn’t seem to cut it. We also loved finding the little open markets with fresh fruits, vegetables and flowers. I remember fondly seeing the artists sitting on the side of the streets with their easel, pens and colors. Oh to be an artist with the sights and sounds of Paris. I ask you how can you not overflow with creativity? How does one explain joie de vivre (joy of life)? Well if someone could tell me where I could find one of those baguettes in San Francisco then I will tell you where to find joie de vivre. So let me know how you think I did on my first guest blogging spot and Fifi maybe you can transform some of my pictures into beautiful art. Laura... Merci Merci!!! I enjoyed your post... taking us to sidewalk cafes and open markets... truly FAB for an Outdoor Wednesday! Laura has agreed to guest blog for me again next Wednesday... I cannot wait to see what she comes up with... in the meanwhile... let's pop over and see what the other Outdoor Wednesday participants are doing HERE! If ANYONE is interested in GUEST BLOGGING ABOUT PARIS or FRENCH things... I have 3 spots open as of NOW... email me for details!!! How nice of you to have a guest, today! And from my well trained eye, I can say she has a lovely eye for Paris and photography. Very fine indeed. Now, on to me and to you as well! You must be missing me terribly. I do hope your first week in Paris has been lovely despite my absence. I do apologize for not being more available but something has happened! Something I never thought possible! I have fallen blissfully, completely and deliriously in love! His name is Raoul! He comes from a very respectable family and they own several castles around Europe! Is that just not the best thing you have ever heard? He hangs on my every word, thinks of what I might need even before I do and looks quite dashing on my arm! Oh, and his family is in possession of many crowns! Who ever thought it possible that I might find my one and only? And who would have thought he would be Italian? Oh, Fifi, life is full of so many little surprises, is it not? Quite a stir erupted when I had to, one by one, tell my other “friends” here in Paris that I would not be available to accompany them to all the many engagements they had invited me to. It would have been so much easier for me to send out one mass email announcing my change in status and so much easier if they all had a Facebook page so that they could just read my status change! But the phone kept ringing and I kept talking! I do actually feel bad for all of them as I am fabulous company. But, Fifi, what else could I do? I must say, as soon as I hung up the phone, I could barely remember the conversations so I recovered quickly! No need for you to worry. Raoul has kept me quite busy with all the getting to know you business he seems to need to do. In my mind, none of that is necessary as that is always revealed as time goes along but he insists on having me all to himself for hours at a time and how could I possibly deny him quality time with me? There is so much more to tell but truly the intent of this missive is to let you know that I am out and about again. I just know you will be wanting to see me! Do phone me right up so that we can make arrangements. You just have to meet Raoul and see what a beautiful couple we make! Petunia who is thinking about learning a bit of Italian so she can understand more of what Raoul is saying but also recognizes the benefits of not knowing! I love your theme...I left a piece of my heart in Paris when I was 20 years old and I feel like it's always there waiting for me each time I have visited since...most recently in December of last year. I love it so much. These posts are taking me back there. You would think with so many French Style loving Americans that there would be an abundance of fabulous street coffees in the US where we all could sit down for French coffee and croissants..., where are they? Hello Fifi! Ohhh Paris...it's one of my favourite cities...I like to watch people sitting at a cafè! Marvellous painting as usual! Have a nice day and good Easter!!! oh what a lovely post and how nice to have a guest! what a great post. i totally want to go back to paris now. I'd go to Paris if I can. I love her post in describing Paris. Great post! And great painting. Baguettes and cheese ..that is sounding pretty good to me! What a lovely and picturesque post!Thank you for sharing. Loving that Paris cafe painting! Reminds me of Les Deus Magots! Have a very Happy Easter with your loved ones, Fifi! My OW blog today is about a virtual vaca in Giverny and South of France. Check it out mon ami! 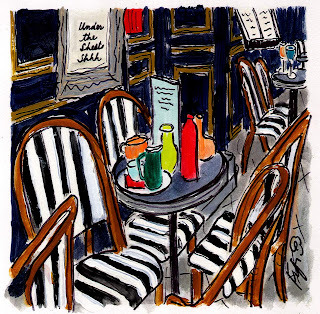 J'adore your guest's blog and the painting you did of the cafe! Laura: If anywhere in the USA is going to have a Paris like baguette it is going to be SF. Fifi: I love your painting. I want to be there and sit with you two lovelies and share some bread, cheese and wine. How I'd love to be sitting at one of those bistro tables right now! Miss Fifi and Miss Laura....ohh how I would love a croissant right now, mmmmm, and the baguette's with berre....I just love the patisseries and the markets. I adore your painting. Thanks for the memories! As an SF girl, I head to Tartine when I need a dose of french flavor. Enjoy! love your painting, the dark walls are amazing. great guest post! i so miss paris. I one day would love to go to canada since it is so close... one day. I found your blog from Artist in Oregon! What fun and I love your painting with those gorgeous striped chairs. You mentioned in your comment that you loved tulips. I have put lots of tulip photos on my blog, BT-TheCraftyGardener if you'd like to see. Any of the garden post (recent) will have some. I just love them too! beautiful guest blogging - I would so love to wander the streets of Paris. Hello FIfi, You aren't named Fifi for nothing. Even your name is French. A perfectly wonderful post about Paris. I have never been there but today, I was in Paris. Thank you. J'adore Paris...mais, Italiano..que bella!! Next month, perhaps d'Italia? Non? Would Fifi mind? I think Petunia would think it would be perfect! Ah...my bags can be packed in less than a minute for Italy (or Paris! )...a girl can dream! First time visitng your blog--I think I picked out at least two dozen paintings that would look amazing on the ... and on the...! Enjoy all the cherry blossoms! Laura, You make me want to go to Paris right now. and Fifi, I love the painting too. great post. Thank you Fifi and Laura. I love your cafe painting ~ looks so inviting and makes me want to sit and spend the afternoon there. Loved the thought of cycling around with a basket of cut flowers and a baguette and brie. I was amazed at the elegant women cycling around the busy streets and roundabouts and they must have had nerves of steel as cars were honking, but they kept their cool. Interesting post. I love Paris, especially at night time when walking along the river on the cobbled streets under the beautiful shimming lamp lights. Truly romantic city. Thnak you everyone for your wonderful comments. Thank you Fifi for letting me guest post. I am working on next weeks post. Enjoy! Tres bien, Mlle Laura!! (It must be the name. ;-) I know what you mean about cereal not cutting it when you come home...I ate the most beautiful bread products of my life in Paris! And I also missed the crepe stands on every corner.